"Sonya and King maintain their facility to the highest safety and esthetic standards. They are always upgrading and working on new projects to better Topline Stables for their own use as well as their boarders, clients and show patrons enjoyment. Sonya cares for each boarder as if they were her own horses. The health and wellbeing of the horses is Sonya's top priority and it is evident in the care and attention she gives to each one. Sonya's students benefit from her experience as well as her drive to see each one do their best and succeed in both horses and life." 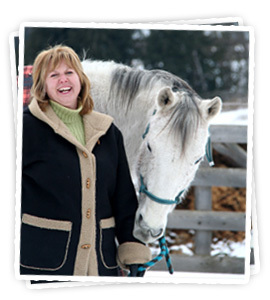 "I am proud to be a long time boarder at Topline Stables, owned by King and Sonya Campbell. I can’t say enough about this facility which is a well presented, relaxed establishment that always gives a good first impression. High standards of ownership are displayed throughout the stables and with their variety of feeding programs, even the fussiest of horse will be happy. Boarding at Topline has been very life changing for me, as I was always a nervous rider with confidence issues, but Sonya’s skill and patience giving me lessons, has taught me how to ride in a safer and more professional way and I am so much more relaxed and less nervous now, and I’ve a lot more confidence for sure. I highly recommend Topline Stables and I’m looking forward to 2013 being the best year ever for me. Thank you King and Sonya for providing such a wonderful place to board my horse. It truly is a place where “Horse and Rider Meet”." I would like to say thank you to Sonya and King Campbell for devoting their time to making Topline Stables the place it is. My horse is well cared for and the facility is fantastic. All the Topline shows have a great turnout and are lots of fun. My friends and I love going to the barn and helping out at the shows. Shuswap pony club is also grateful for the use of Topline Stables for all of the lessons and their regional rally which could not happen if it weren’t for Topline. Thank you." 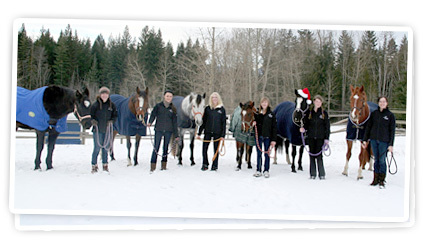 "We feel very lucky to have found Topline Stables when we moved to Salmon Arm in July of 2010. One of our horses is a “special needs” senior (30+). King and Sonya diligently ensure that all his needs are met. They work tirelessly to ensure the well-being, happiness and safety of all their clients, 4 legged and 2 legged! Topline Stables has become our second home. The atmosphere at the barn is friendly and supportive. I feel that all of us boarders take great pride in representing Topline in shows and our everyday lives. Thank you King and Sonya." "I love boarding at Topline because of the atmosphere everyone’s super friendly and always willing to lend a hand. As well, my horse loves to run and play so getting turned out in the big field is what he loves, because he is in his own paddock I always know he’s getting the right amount of feed to help him perform his best. I love Topline and boarding there." "I appreciate the excellent care my horse receives daily at Topline Stables. When work duties take me out of town I’m comfortable knowing my horse is in good hands and will be well taken care of. As someone who has come back to the horse world after several years, I appreciate the help, advice, and coaching I receive. Thank you, Topline." "I like to board at Topline because of the great atmosphere. Everybody is super friendly and supportive of each other. It is also really great to have so many riders to look up to as role models and who are willing to help answer any questions about horses and riding. The facility itself is beautiful and has something for every rider. 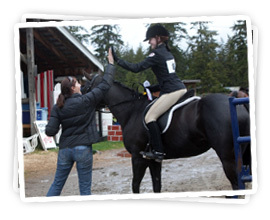 Nobody feels like they can’t do something because any level of rider can ride at Topline. The horses really love it here and Sonya and King do an excellent job to make sure the horses are happy and well cared for." "One only has to read the mission statement at Topline stables to get a very clear picture of what you and King stand for. I know you have invested in yourselves personally and professionally to ensure you are being your best, and creating the best environment for horse and rider to meet, train and compete. King you are always creating, fixing, maintaining, improving, problem solving, and caring about the grounds and facilities. Sonya as a past pony clubber yourself, you know the value of the training and purpose of the program. We know firsthand the compliments your students have received from trainers on the coast who noticed the quality and skills sets you provide for them. It’s all in the little details and you don’t miss a thing! We have had numerous riders and their parents testing or competing around the area and they come back and comment "boy Topline is amazing, wow we didn’t have a clue how great this place is, till we competed at other venues." King and Sonya have truly done an excellent job in maintaining and creating a fun, safe and beautiful environment for our riders to train and compete at, all with great care and consistency. We are grateful!" "I just spent a week at Topline Stables which included a two day Horse Trials BC clinic with Sarah Bradley, the Topline Combined Test and the Topline Summer Horse Trials. This was an incredible training opportunity for my horses and I would like to thank Sonya and King Campbell of Topline Stables and Horse Trials BC for enabling this to happen. Topline Stables is a beautiful facility that BC is very lucky to have. Having a clinic just before the event was great for my young, green horse as it exposed him to the field and jumps then over the next several days transitioned him into the show atmosphere. This was an excellent opportunity for condensed, progressive training and provided a very positive experience for him. Topline has recently incorporated a Combined Test of dressage and show jumping the day prior to the event. I love this idea and found it to be extremely educational and helpful in training and preparing for competition. Separate awards and prizes make the Combined Test a competition of its own. The summer horse trials were fantastic. The hog fuel dressage ring and huge show jump arena with top class show jumps made the event challenging and fun. The cross country had excellent footing, varied terrain, safe and interesting jumps, and provided progressive levels of competition from Starter to Training level. The facility is upgraded constantly and very well maintained. Sonya and King went out of their way to accommodate the competitors and their horses which was wonderful. The atmosphere was calm and fun while still being competitive and top class. Topline also has great prizes too!!"